The 17 GHz active region number, Selhorst, C. L., Costa, J. E. R., Giménez de Castro, C.G., Válio, A. B., Pacini, A., Shibasaki, K., Astrophys. Jour., 790,2, 134, 2014. Nighttime sensitivity of VLF measurements of the ionospheric response to X-ray bursts from a remote cosmic source, Raulin, J.-P., Trottet, G., Giménez de Castro, C. G., Correia, E., Macotela, E. L., Journal of Geophysical Research - Space Physics,119, 4758-4766, 2014. 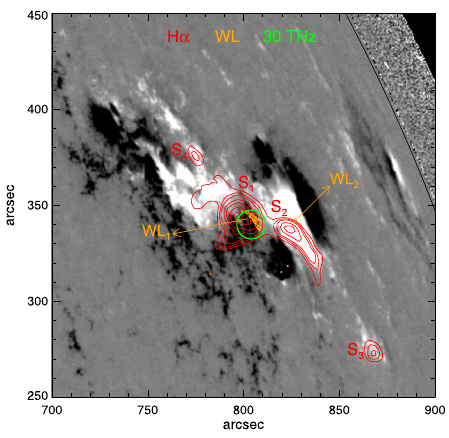 A bright impulsive solar burst detected at 30 THz, P. Kaufmann, S.M. White, S.L. Freeland, R. Marcon, L.O.T. Fernandes, A.S. Kudaka, R.V. de Souza, J.L. Aballay, G. Fernández, R. Godoy, A. Marún, A. Válio, J.-P. Raulin, C. G. Giménez de Castro, Astrophys. Jour.,768,2, 134-142, 2013. Polarization Emission of Millimeter Activity at the Sun (POEMAS): new circular polarization solar telescopes at two millimeter wavelength ranges, Válio, A., Kaufman, P., Giménez de Castro, C.G., Raulin, J.-P., Fernandes, L.O.T., Marún, A., Sol Phys,2013,283,651-665, DOI: 10.1007/s11207-013-0237-4. Unusual emissions at various energies prior to the impulsive phase of the November 4, 2003, large solar flare and coronal mass ejection, Kaufmann, P., Holman, G.H, Su, Y., Giménez de Castro, C.G., Correia, E., Fernandes, L.O., de Souza, R., Marún, A., Pereryra, P ., Solar Phys., 2012, 479, 465-475, DOI: 10.1007/s11207-012-0040-7. The behaviour of the 17 GHz solar radius and limb brightening in the spotless minimum XXIII/XXIV,Selhorst, C.L., Giménez de Castro, C.G., Válio, A., Costa, J.E.R., Shibasaki, K.,Astrop. Jour., 2011, 734,1,64-67, DOI: 10.1088/0004-637X/734/1/64. Equatorial spread-F occurrence observed at two near equatorial stations in the Brazilian sector and its occurrence modulated by planetary waves, Bertoni, F.C.P., Sahai, Y., Raulin, J.-P., Fagundes, P.R., Villat, V.G., Giménez de Castro, C.G., Lima, W.L.C.,Journ. Atmosph. and Sol. Terrestrial Phys., 2011, 73, 457-463, DOI: 10.1016/j.jastp.2010.10.017. Submillimeter-Wave Atmospheric Transmission at El Leoncito, Argentina Andes, A.M. Melo, P. Kaufmann, C.G. Giménez de Castro, J.-P. Raulin,H. Levato, A. Marun, J.L. Giuliani, P. Pereyra, IEEE Trans. Ant. Prop., 2005, 53, 4, 1528. Launch of solar coronal mass ejections and submillimeter pulse bursts, P. Kaufmann, C.G. Giménez de Castro, V. S. Makhmutov, J.-P. Raulin, R. Schwenn, H. Levato, M. G. Rovira, Jour. Geophys. Res., 2003, 108, 1280. Properties of Fast Submillimeter Time Structures During a Large Solar Flare, J.-P. Raulin, P. Kaufmann, C.G. Giménez de Castro, A.A.Pacini, V. S. Makhmutov, H. Levato, M. Rovira, Astrophys. Jour., 2003, 592, 580-589. Determination of Submillimeter Atmospheric Opacity at El Leoncito, Argentina Andes, A. M. Melo, C. G. Giménez de Castro, P. Kaufmann, H. Levato, A. Marun, P. Pereyra, J.-P. Raulin, Telecomunicações INATEL ,2003, 6,32. The new Submillimeter-wave solar telescope, P. Kaufmann, J.E.R. Costa, C.G. Giménez de Castro, R. Hadano, R, Kingsley, J. Kingsley, A. Marun, J.-P. Raulin, M. G. Rovira, E. Correia, Telecomunicações INATEL, 2001, 4, 18-21. The concept of partially overlapping multiple beams for spatial determination of solar bursts time transients at submm-IR wavelengths, Kaufmann, P. ; Melo, A M ; Giménez de Castro, C. G. In: Thermosense XXIV, 2002, Orlando, Florida. Proceedings of SPIE. USA : Eds. X. P. Maldague, Aandrés E. Rozlosnik, 2002, 4710, 31-36. Determination of submillimeter atmospheric opacity at El Leoncito, Argentina Andes, Melo, A M ; Giménez de Castro, C. G. ; Kaufmann, P. ; Levato, H. ; Marun, A. ; Pereyra, P. ; Raulin, J.P. In: XXVII Assembléia Geral da URSI, 2002, Maastricht. Proceedings CD-ROM, 2002, p2202. The New Submillmeter-wave Solar Telescope, Kaufmann, P. ; Rovira, M. ; Giménez de Castro, C. G. ; Hadano, Y. R. ; Kingsley, J. S. ; Kingsley, R. K. ; Levato, H. ; Marun, A. ; Raulin, J.P. ; Rovira, M. ; Correia, E. ; Silva, A. V. R. In: IMOC 2001, Belém, Pará, Brazil. 2001 SBMO/IEEE MTT-S International Microwave and Optoelectronics Conference, 2001. Solar Flare Observations at Submm-waves, Kaufmann, P. ; Raulin, J.P. ; Correia, E. ; Costa, J. E. R. ; Giménez DE Castro, C. G. ; Silva, A. V. R. ; Levato, H. ; Rovira, M. ; Mandrini, C. ; Fernández Borda, R. ; Bauer, O. In: Recent Insights into the Physics of the Sun and Helisphere:Highlights from SOHO and other Space Missions, 2001, Manchester, UK. Proc. of the 24th General Assembly of the IAU Symposium. U.S.A. : Eds. P. Brekke, B. Fleck, and J.B. Gurman, 2000. 203, 283-286. First results of tropospheric transmission measurements at 94 and 212 GHz, Luedi, A. ; Martin, L. ; Magun, A. ; Maetzler, C. ; Kaempfer, N. ; Kaufmann, P. ; Costa, J. E. R. ; Giménez de Castro, C.G. ; Rovira, M. ; Levato, H. In: 6th Specialist Meeting on Microwave Radiometry and Remote Sensing of the Environment, MICRORAD, 1999, Firenze, Italy. Microw. Radiomet. Remote Sens. Earth's Surf. Atmosphere, 2000. 213-220. Multiple High Energy Injections at the Origin of Solar Flares, Kaufmann, P. ; Costa, J. E. R. ; Correia, E. ; Giménez de Castro, C. G. ; Raulin, J.P. ; Silva, A. V. R. In: High Energy Solar Physics - Anticipating Hessi, 1999, Maryland, ASP Conference Series, 2000, 206, 318-322. Progress Report of the New Solar Submm-Wave Telescope (SST) Installation, Kaufman, P.; Magun, A.; Levato, H.; Rovira, M.; Arzner, K.; Correia, E.; Costa, J. E. R.; Giménez de Castro, C. G.; Kämpfer, N.; Raulin, J.-P.; Rolli, E.; Silva, A. V. R.; in Proceedings of the Nobeyama Symposium; Eds. : T. S. Bastian, N. Gopalswamy and K. Shibasaki, NRO Report No. 479., 1999, p.439-442. Sobre a foto: Magnetograma da Região NOAA 11429 no dia 13 de março de 2012 as 17 UT. Os contornos vermelhos representam a emissão em Halpha, o círculo verde a emissão em 30 THz, e em laranja a emissão em white light. Extraido do artigo: Origin of the 30 THz emission detected during the 2012 March 13 solar flare at 17:20 UT.